Have you ever seen the Book of Kells? I did, last month when I was in Ireland. 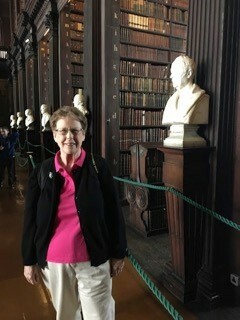 The original book, actually 340 folios, written around 800 CE, is at Trinity College in Dublin. It has its own very impressive exhibit, located on the first floor in a specially climate controlled, dimly lit room. 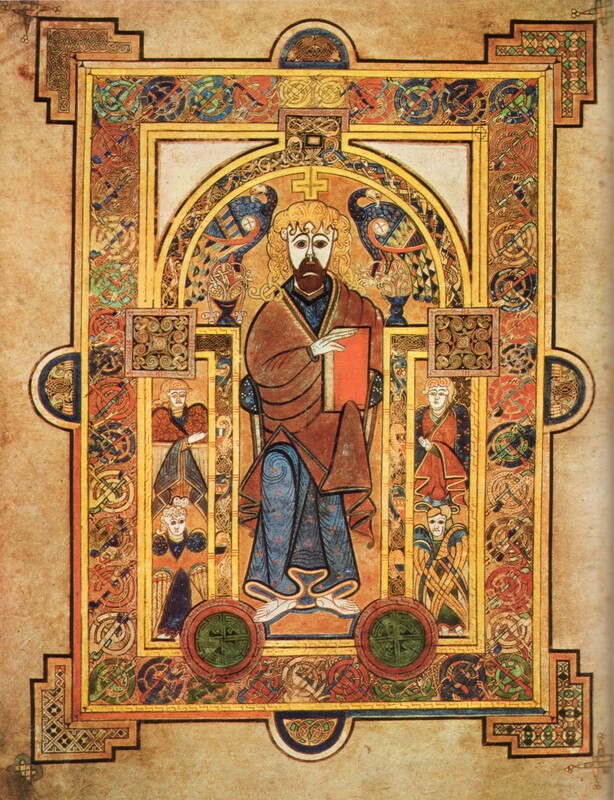 The Book of Kells is magnificent! Each page is beautifully decorated. Three different artists illustrated the book while four principal monks copied the text, which sometimes included decorating the letters themselves. It contains copies of the four gospels that were written by Matthew, Mark, Luke and John. No one is sure if the Book of Kells was created entirely at the monastery in Iona, an island off the coast of Scotland, or the one at Kells in County Meath, Ireland or both. In those days the two monasteries were organized as one community, even though they were far apart. Today the Book of Kells is part of a very elaborate exhibit and no cameras are allowed because it is so old. I was getting ready to exit the exhibit and go outside when I saw a well-worn staircase to my left. Several people were walking upstairs. I was curious. What’s up there? I slowly climbed the staircase to the second floor and entered a square room with people milling around. But it was the room beyond that took my breath away. It was very long and narrow. I don’t remember ever seeing another one like it. It had shelves of books from floor to ceiling on both sides. I’ve never been in a room with so many books! There were over 200,000 in all. I smiled when I found out the name of this room: The Long Room. The bookshelves on both sides of the room were broken up into a series of alcoves. Marking the boundary of each alcove was the bust of a famous author on a tall pedestal. As a budding author, I couldn’t resist having my picture taken with one of them. If you’re having a hard time telling which one is me, I’m the one with my feet on the ground. Sounds like something special to see. Thanks for sharing your experience. I’m glad you enjoyed it. Thanks! Hi, Claire. What an interesting article you wrote, about an intriguing place to visit…especially for writers and scholars. Thanks Kelly. I’m glad you enjoyed it. Claire, how wonderful you were able to enjoy the magnificence of such an awesome place. Your description of the experience makes me want to visit. You and Roger should consider it. You’d really enjoy it. Maybe you’re next trip? Yes, it is a quite amazing collections. I enjoyed to read your writing, too. Thanks Kook-Wha. I’m glad you enjoyed it. Claire, What a treasure to view! I watched a documentary about the history of religion in art and remember the monks on an island creating this beautiful book. Thanks! Yes, the book itself, as well as the other artifacts, was very beautiful.